"Avoid the obvious and strive towards the impossible." I trained as an actor at The Arts Educational Schools, Chiswick. Since graduating I appeared in productions at various theatres inlcuding The Marlowe, The Arcola, Southwark Playhouse and The Kings Head. reflected in my work and the actors I work with. The whole show had a searing intensity...slick pacing...this show was brilliant. Directed by Scott Le Crass, the play has a filmic quality...should not be missed. Scott Le Crass creates beautiful and disturbing images while numerous characters talk about their lives and their deaths. The direction from Scott Le Crass make Conference Call the gripping centrepiece of the evening. Scott Le Crass creates a veritably eerie atmosphere that probes deep into our minds in a stealthy way. See this show and you will be treated to a fast-paced, quick-witted, rather ludicrous production that will leave you – as it did me – grinning after it ends. Director Scott Le Crass keeps the pace up in this production but doesn't sacrifice clarity and the little touches like French accordion music to accompany Callimaco's 'Allo 'Allo–style disguise and the false nose disguises are a treat. A confidence that speaks of clean direction from Scott Le Crass. With very little movement in the piece, director Scott Le Crass has concentrated very successfully in varying the pace between and even within scenes, and has brought out excellent work in his actors. This is a striking production which director Scott Le Crass should be extremely pleased with. Scott Le Crass's direction is well-paced in a fine production that shows how chance, ambition and social unrest turn a military hero into a tyrant. It also makes Shakespeare's tragedy seem as contemporary as this week's newspaper headlines. Contemporary playwrights who I admire and enjoy the work of include David Harrower, Rebecca Prichard, Bernard Marie-Koltes, David Eldridge, Philip Ridley, Timberlake Wertenbaker and Tom Basden. 2011 - 2015 - Workshop Facilitator/Leader - Almeida Projects (12-25yrs). Projects include Dead Silence, The Turn of The Screw schools residencies, Play in a day (Devised piece), Bernarda Says (Devised piece) which was part of a schools residency using the themes from The House of Bernarda Alba as a stimulus. Play in a Day : What They Saw (Devised Piece) - all pieces performed @ The Almeida Theatre. I directed a piece called 'The Dialogue Project' with Almeida Projects Young Friends with the guidance and support of Karl James. Worked with Almeida Academy and Almeida's Young Friends on a new writing project called T3XT that was part of the Islington Word Festival. I directed a T.I.E. with Almeida's YFTC (Young Friends Touring Company) called Dominoes which toured London schools and was also performed at The Almeida. 2013- 2014 - Birmingham Rep's Facilitators pool. 2012 - 2013 Assistant Tutor - Cut 2, The Queens Theatre, Hornchurch (14-18yrs). 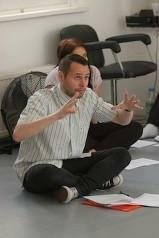 2012 - 2013 - Comedy and Drama Tutor - PQA (Pauline Quirke Academy), Wolverhampton (6-18yrs). 2008 - 2011 - Theatre Lecturer/Director - Miskin Theatre. BTEC level 3 to 5 courses (16-35yrs). Productions include Stuff I Buried in a Small Town by Mike Barlett, Peter Pan by J M Barrie, Flowers for Algernon by David Rogers, Roberto Zucco by Bernard Marie Koltes, Pericles by William Shakespeare, The Eiffel Tower Wedding Party by Jean Cocteau, Market Boy by David Eldridge, The Laramie Project by Moises Kaufman, The Insect Play by The Kapek Brothers and Peaches by Nick Grosso @ Etcetera Theatre. 2005 - 2011 - Resident Director - Riverside Youth Theatre (7-16yrs). Productions include Sunlight and Moonlight by Elaine L Lindy, adapted by Lindsey Parker, Comedy (Scripted Duologue Performance) by various writers, Evacuees (Devised Piece), Forgotten Fairytales by Charles Perrault, adapted by Scott Le Crass, Pick n Mix (Revue). 2004 - 2009 - Resident Director - DAOD'S Youth Theatre (9-18yrs). Productions include The Vikings and Darwin by David Mamet (National Theatre Connections) @ Watford Palace Theatre, Beauty and the Beast /The Coming of the Kings by Ted Hughes, Work and Play (Musical Revue), The Chrysalids by David Harrower, Laughing on the Inside (Revue), An Alien Stole my Skateboard by Randell Lewton, The Queen Must Die by David Farr, The Coming of the Kings by Ted Hughes, After Juliet by Sharman Macdonald, Brokenville by Philip Ridley. Antony Roper School, St Clements Community Project and Theatre Workout.